Hey guys! 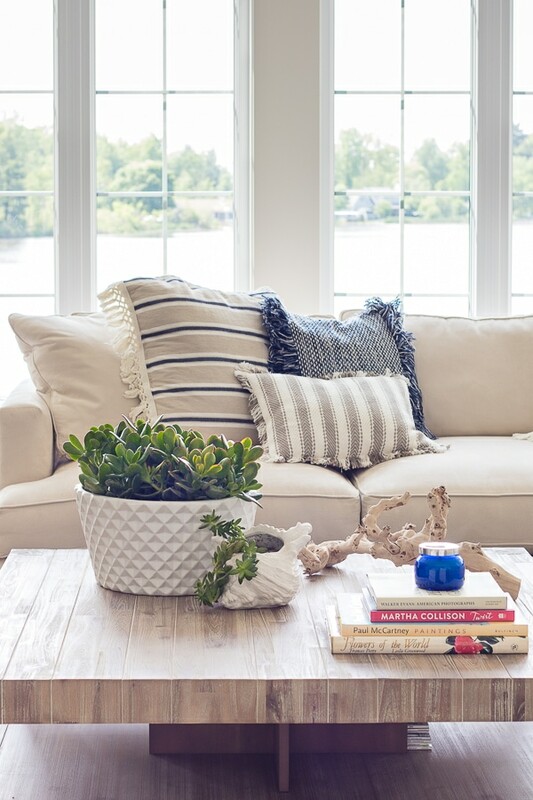 Coming to you on a Thursday with my “lake house blue and white living room decor”, because the Tuesday after Memorial Day weekend is possibly the Monday-iest non-Monday there is and I accomplished nothing. Which also reminds me, I wanted to let you know I probably won’t be posting on my regular Wednesday/Friday schedule this summer with my kiddos home. My priority is hanging out with them while they still think I’m kind of cool (or at least tolerable…). Also, living here on the lake, you can imagine we pretty much spend all our time out in the boat or swimming, which requires my full attention and isn’t conducive to working on my laptop. I’m hoping to get out at least 1 post a week, but hang in with me if the days are off. Did you know you can get my posts delivered right to your email? That’s the easiest way to make sure you don’t miss a post! You can use the “subscribe” box at the top of my site. While we still have a week and half of school left, my house is totally in summer mode, and I’ve made a few changes here in the living room. The biggest change is our new coffee table, which I’m loving! I know a lot of you were fans of the the old grey table, but the shape and scale didn’t work for the scope of this room. Our living room is 22×22 and the too small, too tall coffee table wasn’t cutting it. The larger size of the table is perfect for everyone around the couch to be able to kick their feet up on. I love the cleaner lines and it’s completely solid and heavy (just ask the two delivery guys who wrestled it through the front door) vs. the rickety old one. It may be a little too sturdy, because my kids have taken to using it as their stage during dance parties, sigh. 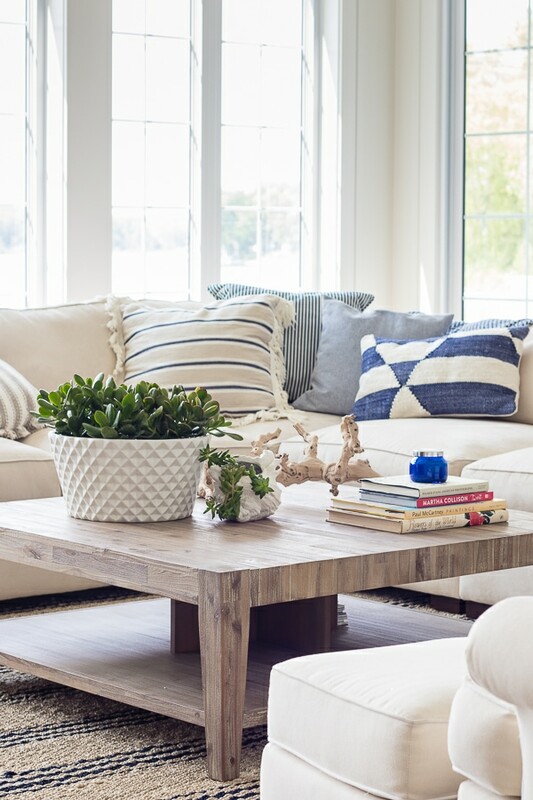 It really anchors the couch to the chairs and pulls the seating area together better. The rustic wood grain of the table keeps it from feeling too modern for our space. I’m still working on the styling of it, I just shopped my house and threw a few things on there for the time being. Although, I did pick up this huge planter and filled it with succulents from our local greenhouse specifically for here. 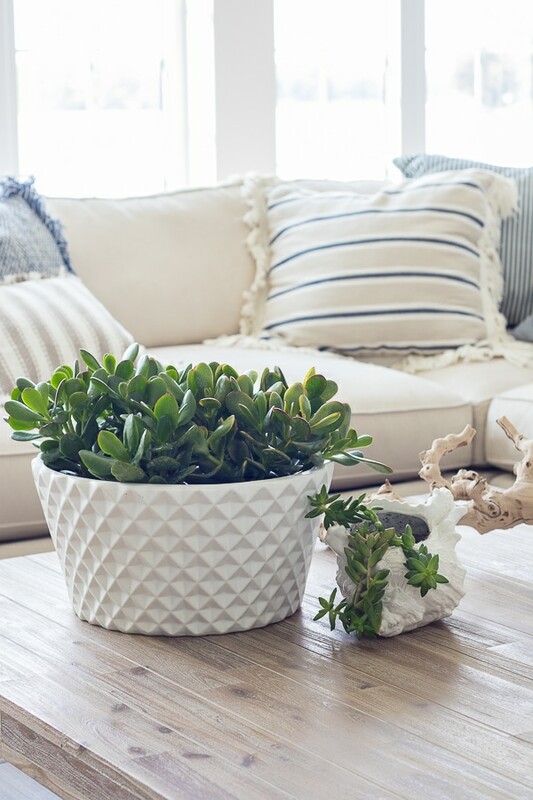 I love the pop of color and the texture on the planter and it’s still low enough that we can see the tv over it. I picked up a new stag horn fern for my sofa table too. I love that the table has storage underneath. It’s a great place to hide the stash of magazines that I keep meaning to find the time to read and it’s also perfect to hide my laptop. Eventually, I hope to pick up some baskets of some sort to store puzzles or games for the winter. This is our Sunday spot in the Fall/Winter where we listen to audible books with the kids and do puzzles after church, so I’m excited to have a bigger surface to work on. A few new pillows also jumped in my cart at Home Goods that I added to the mix. They all have a fun textured feel. I don’t like to add too much extra color to this room in the summer, because I really want it to be about the view. I love adding more texture, because it adds interest to the room without competing with the outside. Although it was pretty gloomy when I shot this so it’s typically a little more vibrant looking. Can you believe we have been in this house for a year now? It seems crazy, it totally flew by! We have made a few changes since then (including this table) and it definitely feels 100% like home. If I can give you one tip about moving into a new place – take your time finding the right furniture and home decor. Don’t just buy the first thing you see to fill the space, really take the time to hunt for each piece you love. It’s been so fun to bring it all together and this room feels really complete now. Sectional – Art Van Furniture It’s available in different fabrics, we have the lightest one. Great coffee table. Where is the TV? You mention it but I don’t see one. It in the cabinet to the right of the fireplace, it’s on a swivel arm so it pulls out for the whole room to view. I would never get a THING done if I had that view. ;-) Great room! Enjoy your summer! Love the room and the view. Is Art Vans a local store? I followed the link for your sofa info and I wondered if they deliver throughout the country. Enjoy your summer! Art Van is a Midwest chain so I know them have them in a few other states but it depends where you live – thanks! Simply beautiful! Well done to perfection! Please tell us how you like your floors now that you have lived on them for a year. What is Vanier engineered hardwood? We still love them after a year. Engineered hardwood is real wood but just a thin layer on the top with an underlayment product attached underneath. So it’s not solid oak all the way thru. How is your flooring for cleaning? We are building now and I”m considering this flooring, but I’m wondering if dirt gets stuck in the grooves? We have many children running and in and out of the house all day long. The table is perfect for the space- love it! Thank you, we are loving it here! We just purchased a new table also!! It really makes a difference! Love yours!! Looks great in your room! Thanks Maggie, it feels like it pulled everything together in here! Love the striped rug you have! Can you give me a specific name or style number? I can’t find it on the Wayfair site. Thanks! Sorry Bev the link wasn’t working, I fixed it now but it’s a Dash and Albert jute rug. You can search that on Wayfair or try the link on the blog again – thanks! Does the awesome driftwood on the coffee table have a story? Or is there a source for something like that? HI Kelly, I just bought some grey felt soft baskets at IKEA and they come in two sizes and they might work under your table. Sorry I don’t know the name of them but they don’t have any other ones like it. Hope it works for you I really like them. The best part is when you don’t need them they fold up flat. Good luck. Oh good to know, I’ll have to check it out! Thanks! 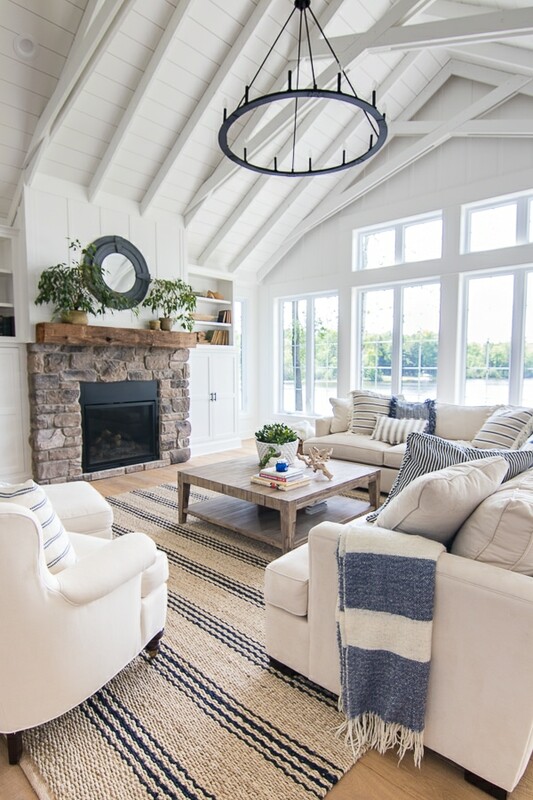 I linked the flooring at the bottom of this post but you can also search “lake house flooring” on my blog and find links to everything we used – thanks! Your ceiling intrigues me. Please do a feature on how it is insulated and if the rafters are all structural or for looks. I am curious as to how you insulated it. 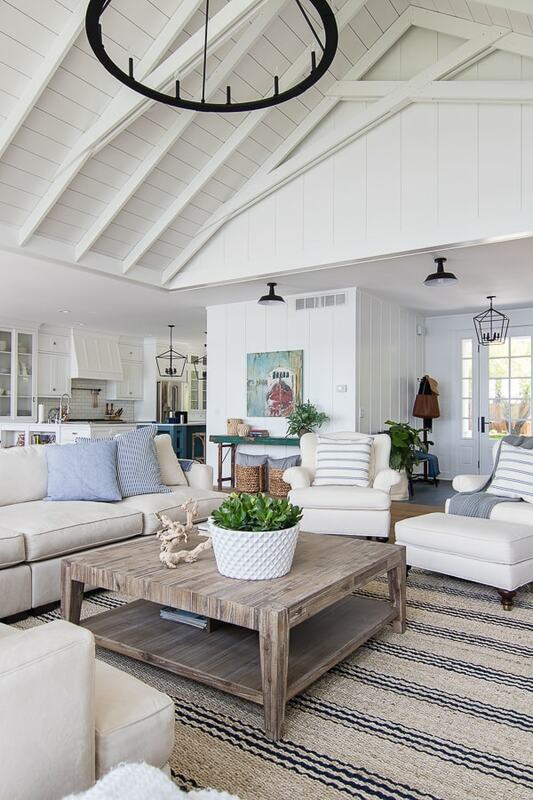 Hard to want a boring white, flat ceiling after seeing this one. you have a beautiful home. thank you. I agree with Alice regarding the beamed ceiling! Between the view and the ceiling, I don’t know where to gaze first :-). Love the finished (mostly, as you said) product there in the room. Ab Fab!! Enjoy your family and the summer in your marvelous, wonderful home! Thanks so much Lisa, so ready for summer! Bright and fresh! I’m inspired to brighten up my home to the extra white! It’s such a great true white! Hi Kelly, I’ve admired your homes for awhile now. You do an amazing job and make it looks so easy! We’re currently repainting our whole house after 10 years, and I want to switch it up to looking fully coastal. We’re on a lake in NC. It was built at a time with lots of beige in use and I’m really loving (but fearing) the white look. Can you give advice on the Extra White you used in your main spaces? Has it held up with kids and lake traffic? What was the sheen and type of SW paint? And how did you choose coordinating paint colors for adjoining spaces? Unfortunately, we’re not able to do ship lap just yet, so it would just be on dry wall. We did already use Agreeable Gray in our downstairs, and Sea Salt And Monorail Silver (which I love) in downstairs kids bedrooms. Choosing a palette is overwhelming! Any advise you can give would be great. 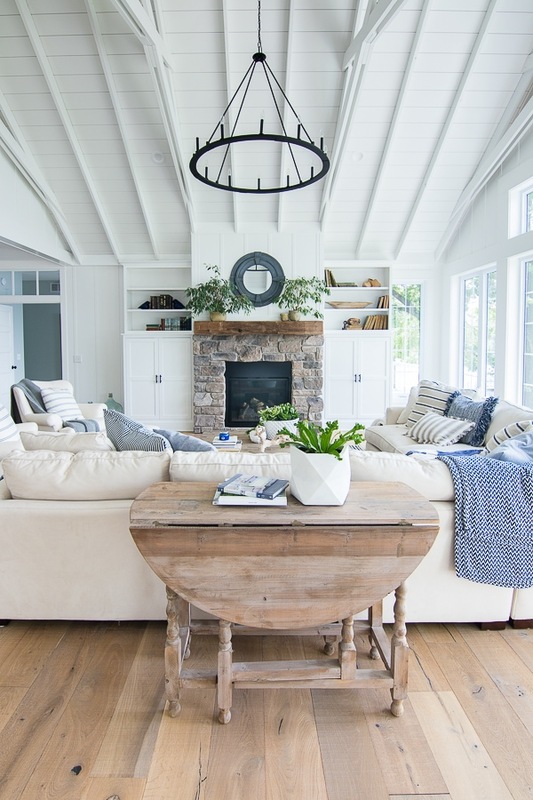 Even if there is a not-so-brave option for main rooms that gives that white neutral feel. Thanks! Hi Megan, the extra white has been great bc it cleans up super well with a magic eraser :) We used satin on all the trim, board and batten and cabinets but the rest of our walls are painted in a matte finish. I did shades of blue and grey in the adjoining spaces because I wanted the house to have good flow. 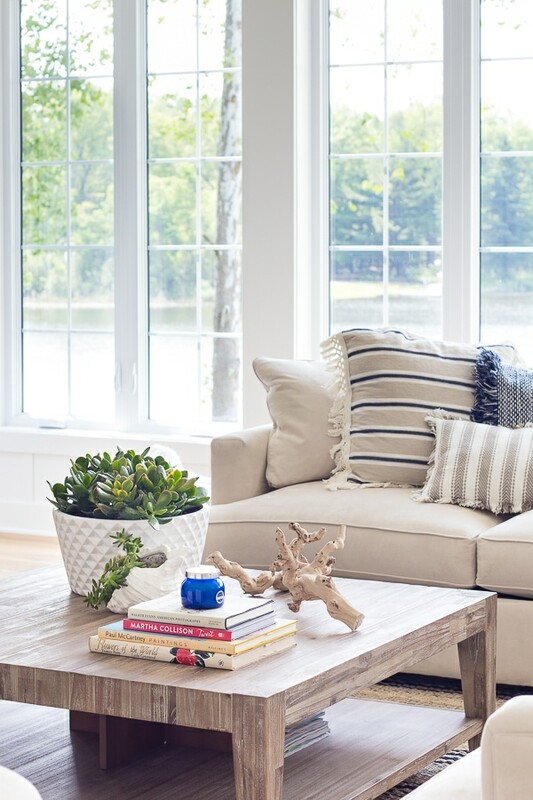 If you search “lake house paint colors” in the search bar on my blog you will find the entire pallet I used plus some tips! Thanks! I use a Norwex mop that is very barely damp, only maybe every other week or so. I mostly vacuum, I’ve found that works the best. I have one of those roomba type vacuums that works great! I also have a special wood floor vacuum. Hi! 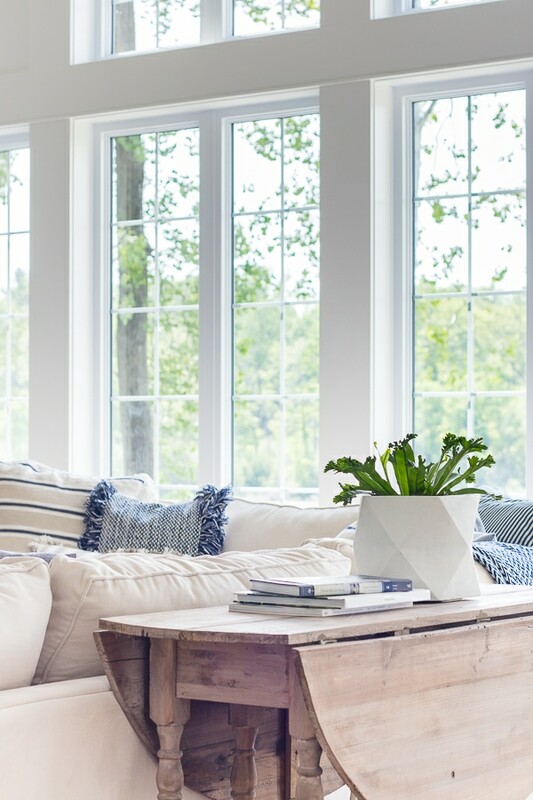 Where is the blue and white stripe throw blanket from? Oh man I’m not sure I’ve had that forever I’m not sure! Your home is absolutely amazing! I don’t know if I have ever kept coming back to a website more. Your choices are fantastic! Which colour of floors did you go with in the Builddirect. It is the Dover or the Robin? I really like the article. in the living room, the main thing is sofas and pillows. you need to choose good designed sofas and pillows which enhance the overall look of the living room. and you have done it very well so I am impressed with it.